Entra Health Systems, an international applied healthcare technology company unveiled its new Patient Messaging and Alerts system built into the web technology that supports the MyGlucoHealth glucometer. Messaging and Alerts allows patients to automatically send notifications about their changing condition or reminders to tell them when to test. Individual notices can be sent by SMS text message or email. "This unique feature helps engage persons with diabetes in their own individual care as well as forms a partnership with family members to help the patient better monitor their health and manage their disease," said Richard Strobridge, Chief Executive Officer of Entra Health Systems. "The targets and alerts section of the MyGlucoHealth Portal allows the patient to establish critical 'threshold' settings for blood glucose levels and then communicate significant changes to anyone they designate. The system monitors upload results and automatically sends notifications to the patient, their physician, family member, or caregiver whenever a threshold is exceeded." By managing their individual online profile, each patient can establish high and low thresholds based on personal goals and health condition. The menu allows the patient to designate phone numbers for mobile phone text messages, as well as email addresses for recipients of alerts. In addition, there is a 'reminders' messaging feature on the MyGlucoHealth portal that allows the patient to set up a series of notifications to help them maintain a consistent level of testing, posting or a supply of strips. Reminders can be set up at 15-minute intervals throughout the day to alert the patient to test, upload their stored testing results or to order additional test strips when their supply is low. The website keeps count of strip usage and integrates with MyGlucoStore.com to notify the patient when it's time to order additional strips. MyGlucoHealth is the first FDA cleared and CE certified Bluetooth blood glucose meter. The meter, along with the MyGlucoHealth Network, form an integrated telehealth platform supporting patients and healthcare professionals in the control and treatment of diabetes. MyGlucoHealth gives patients more direct control over their care and provides clear lines of communication with clinicians and caregivers. The MyGlucoHealth meter works in combination with a real-time online data collection network to upload and manage blood glucose readings using a mobile phone or PC. This eliminates the need for patients to maintain personal logbooks, improving data accuracy and removing the opportunity for incomplete or 'manufactured' readings. 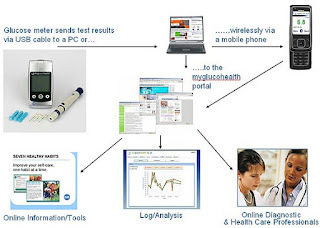 Using the MyGlucoHealth Portal at www.myglucohealth.net, or regional sites throughout the world, patients securely transmit and evaluate their daily readings while communicating those same results to their families, caregiver or diabetic care specialist.